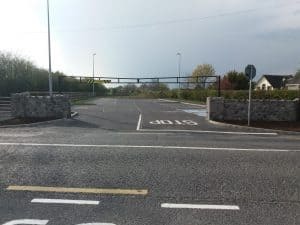 A new 33 space car park, which includes two disabled spaces, has been opened in Adare by the Limerick City and County Council. The car park is on the Kerry side of the N21, opposite Scoil Naomh Iosaf, the boys’ school. The car park provides much needed safe parking for cars during times when pupils are being dropped off or collected in the afternoon from the school. A new relocated pedestrian crossing outside the school linked by new footpaths provides a safe pedestrian route for parents and pupils attending the school. The Mayor, Cllr James Collins said “ these new parking spaces are welcome for the village of Adare. They will help with traffic management during school opening and closing times”. He added, “Adare is one of Limerick’s tourists gems and this car park will help make the village more welcoming”.